I made this card using more of the GORGEOUS Lucy Bird products by Imaginisce, including paper and a gorgeous pink flower. 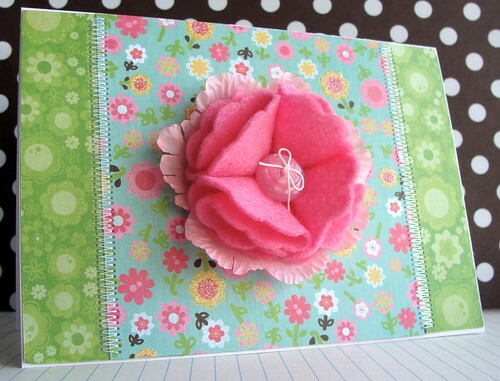 I added my own flower on top of this - made out of felt, following THIS fab tutorial by Betsy Veldman. She rocks. Love how you created this Bold flower. These papers are so yum. Really like your papers. Beautiful card! You're right, it needs no sentiment! Gorgeous from top to bottom! the card is lovely....a reflection of the cardmaker! very cute colorful card! the big flower is gorgeous! Such a happy, happy, HAPPY card! As always, it's a treat to see your creations, Lucy! 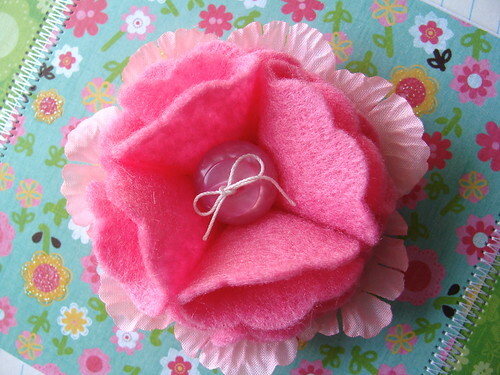 Your felt flower is totally stunning. It really is the focal point and needs nothing else to enhance it. Beautiful card, love the flowers on it. This is SO gorgeous, love the flower, the pp, and the sewing!! gorgeous flower, love the bright colors on those yummy papers.